Amy Glennon, an Industry Fellow with the James M. Cox Jr. Institute, wraps up her lecture series with “A summary and conclusion” April 9 at 2 p.m. in the PAF. 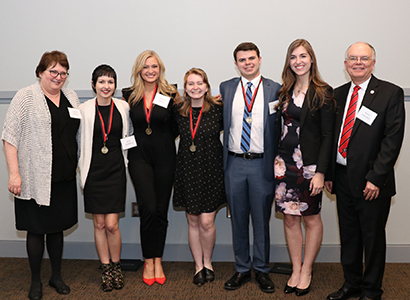 The James M. Cox Jr. Institute for Journalism Innovation, Management and Leadership at Grady College recognized its inaugural class of Levin Leaders on March 4, 2019, presenting the 15 aspiring media leaders with the Cox Institute’s Leadership Medal. The Cox Institute’s Industry Fellow award and five departmental scholarships representing outstanding achievement were also presented. The Levin Leaders were selected for the leadership program from a pool of faculty nominations based on their commitment to professional development through work in student media, internships and other student activities. They are: Collin Huguley, Danny McArthur, Taylor Maggiore, Christina Matacotta, Kelly Mayes, Skylar Nicholson, Brittany Paris, Myan Patel, Casey Rose, Kelsey Russo, Erin Schilling, Alexander Soderstrom, Alexandra Travis, Ashlyn Webb and Rebecca Wright. These students, family, faculty and guests gathered at the University of Georgia’s Special Collections Library for a dinner ceremony where the students heard from the Amy Glennon, Grady class of 1990, who has served this year as the Cox Institute’s Industry Fellow. During the scholarship presentations, Erin Schilling and Rebecca Wright were awarded Conrad C. Fink Scholarships; Alexander Soderstrom received the Todd M. Bauer Memorial Award and Casey Rose received the first Barry Hollander Award. Charlotte Norsworthy, who will graduate in May, was named the Morris Media Fellow, which includes an assistantship for continuing her studies at the master’s level at Grady. The students participating in the leadership program met weekly during January and February with Dr. Keith Herndon, professor of practice in journalism and director of the Cox Institute. The sessions featured student discussion leaders guiding conversations about leadership principles drawn from the “Your Leadership Edge” book published by the Kansas Leadership Center. The students said they found value in leadership discussions with their peers, especially in the context of news and media professions. “The best part, hands down, was getting to have down-to-earth chats as a group about great topics that forced us to think,” said Myan Patel. Alexandra Travis said, “This program has taught me that there are so many ways to be a leader, and my style is just as valid as others.” Danny McArthur said being a Levin Leader has given her more confidence. “While the stereotypical idea of being a leader is often about how many important positions you hold, this program taught me that . . . I can be a leader with whatever I do,” she said. Check out more pictures from the banquet here. Amy Glennon, an Industry Fellow with the James M. Cox Jr. Institute, continues her series of lectures. “The journalist process and political division” will be held March 21. All lectures are at 2 p.m. in the PAF. Also join for her next lecture, “A summary and conclusion” April 9. Amy Glennon, an Industry Fellow with the James M. Cox Jr. Institute, will continue with her lecture series. “News organization culture disruption” will be held March 5. All lectures are at 2 p.m. in the PAF. Also join for her next lecture, “The journalistic process and political division” on March 21. Please join us for two days of immersive training in the craft of journalism from three world-class instructors: Nick Chiles, Jamie Lauren Keiles and Bob Sullivan. This event is free for students. Students must email Charlotte Norsworthy to register. Professionals are $10. Registration is required for all professional attendees. Register here. Bob Sullivan will host two sessions on developing reporting skills and the art of interviewing. Both sessions will take a multi-platform perspective. Session 1: 9:05 a.m. – 9:55 a.m. Session 2: 10:10 a.m. – 11 a.m.
Nick Chiles will conduct two sessions of a writing workshop focused on creating clean, concise and compelling copy. Session 3: 1:25 p.m. – 2:15 p.m. Session 4: 2:30 p.m. – 3:20 p.m.
Jamie Lauren Keiles will lead participants through two sessions about the business of writing for money (in print and online), as well as how to formulate story ideas as pitches that editors read and accept. The workshops will also discuss how to negotiate pay and other practical skills for building a career as a freelance writer. Session 5: 9:00 a.m. to 11:30 a.m. Session 6: 1 p.m. to 2:30 p.m.
Amy Glennon, an Industry Fellow with the James M. Cox Jr. Institute, will deliver the first lecture of her series this week. “Leading through disruption” will be held Jan. 31. Also join for her next lecture, “News organization culture” March 5. Amy Glennon, a former publisher with Cox Media Group, will serve as an Industry Fellow with the James M. Cox Jr. Institute for Journalism Innovation, Management and Leadership during the spring 2019 semester at the University of Georgia. Glennon, a 1990 graduate of the Grady College of Journalism and Mass Communication, was publisher of The Atlanta Journal-Constitution and later publisher of Cox Media Group’s Vertical Businesses, a portfolio of pure-play digital content sites that included DawgNation.com, several national sports sites, a national Hispanic news and entertainment site, as well as a lifestyle e-commerce site devoted to Southern cooking and entertaining. As the Cox Institute’s Industry Fellow, Glennon will be a training resource for students taking the Managing News Organizations course and will present several lectures for the students, four of which will be open to other students, faculty and members of the UGA community. Glennon’s open Industry Fellow lectures for 2019 will be held in the Grady College’s Peyton Anderson Forum at 2 p.m. on Jan. 31, March 5 and 21 and April 9. “I’m honored to be returning to Grady for this program, particularly because its roots link back to Professor Conrad Fink. He was a tremendous mentor to me and I hope to pay that forward in some way,” Glennon said. Keith Herndon, director of the Cox Institute, said Glennon’s management and leadership experience during a time of significant digital disruption in the news industry will be invaluable to the student journalists as they study shifting business models and consider innovative paths forward for the news industry. Glennon was the first female publisher in the Atlanta Journal-Constitution’s 150-year history. The publisher position topped a 24-year career at the newspaper that involved numerous roles in both the news and the business sides of the AJC. Glennon began her professional career at The Gwinnett Daily News. Glennon is a Grady Fellow and the recipient of the 2014 Henry W. Grady Mid-Career Alumni Award. She has held board seats with the News Media Alliance and the Inland Press Association; and is an active member of the Georgia chapter of the International Women’s Forum. Glennon is married to Mike Glennon, also a UGA grad. They live in Atlanta with their daughters Kate and Abby. Glennon said she treasures her time at UGA — both time spent in the classroom at Grady and her three years at The Red & Black, and fondly remembers her classes with Professor Fink. Fink founded the Cox Institute and initially created the Industry Fellows program, which was on hiatus for a few years and reinstituted in 2017 with Richard Griffiths, former vice president at CNN serving as the Industry Fellow that year. Marilyn Geewax, former senior business editor at NPR, was the Industry Fellow in 2018. Four Grady College students were recognized in New York City during the fall conference of the Society for Advancing Business Editing and Writing (SABEW) through a fellowship organized by the college’s Cox Institute for Journalism Innovation, Management and Leadership. The Cox-SABEW Fellows for 2018 were: John Durham, Collin Huguley, Charlotte Norsworthy and Amy Scott. The students were recognized during a luncheon held October 25 at Reuters in New York City. The Cox-SABEW Fellowship was created to honor students who have taken the initiative to engage in business journalism and business education through class assignments, student media and professional internships, said Dr. Keith Herndon, director of the Cox Institute. This year’s group marked the sixth year of the partnership with SABEW, which was created in 2013 and has included 24 students to date. This year’s program is also part of a new two-year readership initiative the Grady College has established with Barron’s through a sponsorship by PagnoKarp, a wealth management and advisory firm. The student’s kicked off Grady’s new relationship with Barron’s during a lunch hosted by Katherine Bell, Barron’s Editor-in-Chief. In addition to attending the SABEW conference and Barron’s luncheon, the students also met with business journalists from Fortune magazine, NPR and the Wall Street Journal. The Fortune visit featured meetings with Grady alumnae Polina Marinova (ABJ’13) and Grace Donnelly (ABJ’16), who are both associate editors at the business magazine. Also, the students were hosted during the conference and at NPR by Marilyn Geewax, who recently retired as NPR’s senior business editor. Geewax is on the SABEW board of directors and is serving this year as an Industry Fellow with the Cox Institute. 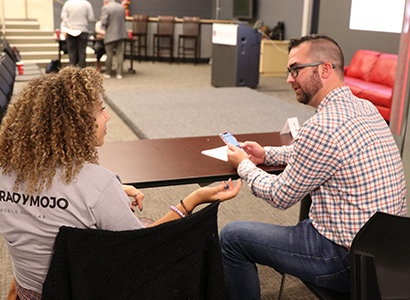 A group of 19 journalism students completed the Grady College’s Fall 2018 Mobile News Lab with a projects showcase held Monday, Oct. 22. The Mobile News Lab students experimented with a variety of mobile newsgathering tools and techniques and produced a multi-media story package optimized for mobile platforms. Students learned from Grady faculty and guest speakers before presenting their work during the projects showcase. The extracurricular program is operated by the James M. Cox Jr. Institute for Journalism Innovation, Management and Leadership. This year’s program was sponsored by the Georgia Association of Broadcasters. The Fall 2018 participants included: Nicolette Brown, Dori Butler, Mauli Desai, Hannah Echols, Rachel Grace, Sarah Hammond, Donovan Harris, Margaret Holland, Kaley Lefevre, Christina Mattacotta, Kelly Mayes, Charlotte Norsworthy, Brittany Paris, Maddie Ray, Amy Scott, Sydney Shadrix, Alex Travis, Ashlyn Webb and Jessica Wurst. The Mobile News Lab included smartphone techniques for news photography and videography and best practices for presenting news content in a mobile environment. Keith Herndon, director of the Cox Institute, led the program and was assisted by Journalism department colleagues, Amanda Bright and Mark Shavin. The students also learned about developments in the news app market from Mellissa Long, the chief journalism officer at Ground. Blake Sabatinelli, the CEO of Newsy, spoke during the certificate ceremony following the project showcase and served as a guest judge along with Bright and Donnie Fetter, executive editor at the Athens Banner-Herald. Alex Travis shows her project to Blake Sabatinelli. The students were encouraged to create and show their projects on their phones. All of the Mobile News Lab projects will be posted soon to GradyNewsource website. Upon completion of the Mobile News Lab, participants received a certificate of achievement awarded by the program’s 2018 sponsor, the Georgia Association of Broadcasters. “The Grady Mobile News Lab is set apart as a training program because of its relationships with industry partners. We appreciate the support of the GAB this year to help us bring this experiential learning opportunity to our students,” Herndon said. A new gift pledge from Adam Levin and the Philip and Janice Levin Foundation will establish the Levin Leaders Initiative, an expanded leadership development program for journalism students presented by the James M. Cox Jr. Institute for Journalism Innovation, Management and Leadership. The Levin family’s gifts and pledges to the program to date exceed a quarter million dollars. The Cox Institute, part of the Grady College of Journalism and Mass Communication at the University of Georgia, launched its leadership program six years ago and has since trained 85 of the college’s best journalism students. Adam Levin discusses the role journalists need to play in educating consumers about identity theft and ways to prevent it during a lecture at Grady College in February 2016. The Levin family’s support provides for curriculum development, training materials, speaker expenses, experiential learning opportunities and the annual leadership awards banquet. 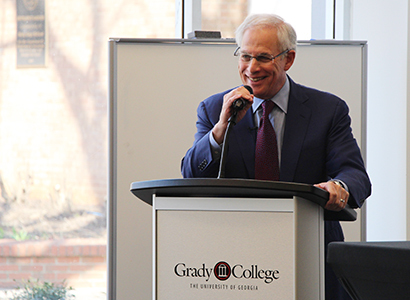 Charles Davis, dean of the Grady College, said the continued support of this program by Adam Levin and his wife, Heather McDowell, and the Philip and Janice Levin Foundation is a testament to our shared vision of preparing students for leadership roles in our democratic society. “They understand the vital mission of the news media and are with us as we help build its future,” Davis said. Levin is a nationally recognized expert on cyber security, privacy, identity theft, fraud, and personal finance and has distinguished himself as a fierce consumer advocate for the past 40 years. His book first brought him to the University of Georgia as a keynote speaker in a privacy issues conference co-sponsored by the Cox Institute, and he has returned several times to speak at Grady about privacy and cyber security. Levin has engaged with many Grady students during his visits and said their caliber and commitment inspired the decision to support a training program that looks to the future of the news media. Levin’s mission is to educate consumers, businesses, law enforcement officials and lawmakers on identity management and protection, privacy, credit, and election security issues, which has resulted in the publication of his articles in numerous national news outlets. Levin is also a regular on national television and radio programs where he provides expert commentary.